Who Wants a 66mm Telescope? 66 millimeters? You mean 66 millimeters of telescope aperture? You’re joking, right? What good is that? “Not much” would’ve been most amateurs' answer back in the days of the Dobsonian revolution. But if you’ve looked around you recently on the club or star party observing field, you’ve probably noticed that smaller aperture telescopes have made a dramatic comeback. Yeah, you still see some honking-monster Starmasters and Obsessions, but you’re also seeing far more SCTs, MCTs and refractors of late. Why? Because many amateurs have decided that, while aperture is a very important thing, it’s not the only thing. A portable (not merely transportable) telescope on an accurately driven go-to mount has a lot going for it, even if you have to sacrifice some “inches.” That’s what I am hearing from quite a few scope-savvy boys and girls, anyway. SCTs and MCTs? Y’all know how I feel about them, but what’s my take on small refractors, color-free APO refractors? It’s no surprise APOs are popular and that their popularity shows no sign of fading, especially now that you can obtain very well-made (Chinese) apochromat OTAs in the 60 – 80mm range for prices in the half-a-grand category or less. These little telescopes are finely made and super portable, things that tend to appeal to quite a few folks, especially as they hit late middle age. Small APOs have multiple uses, and almost any observer will find one is good for something. In fact, the only real bar to the appeal of these little apochromats heretofore has been the many $$$ required before you could get your hands on one. Now, even for the cheapskates among us (like your Ridiculous Old Uncle), excellent 80mm apochromats are beginning to replace the ubiquitous 80mm short-tube achromats we’ve loved so much and used so much over the last seven or eight years. Who’s the real star of the Chinese apochromat show, however? The 66mm. That’s right; suddenly everybody seems to want a 2.6-inch telescope. 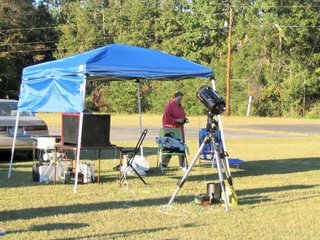 I got a chance to tote this elegant looking little scope out to our club dark site located near the metropolis of Tanner-Williams, Alabama this past Saturday night. It was a muggy evening, that’s for sure, just like you’d expect in late August down on the Gulf Coast. Nevertheless, the Milky Way was dramatic away from the Possum Swamp light-dome, and the summer deep sky beckoned in the heavy air. This was the first time I’d had a chance to really use the 66, and I wasted no time pointing it in the direction of the countless burnished wonders crammed into Sagittarius. What was the experience of using a small, medium focal ratio (about f/7) scope like? Frankly, I came away amazed. Yes, it is just 66mm, but those are 66 finely made millimeters. Despite a not-inconsiderable reduction in aperture when compared to my dear little Synta Short Tube 80, the WO easily outperformed that scope, showing stars, or at least graininess, in quite a few globulars, and not just M22. Anything but 22 basically turns up as a fuzzball in the ST80. Bright stars? Dang. In focus or out of focus either way, no spurious color did I see. Weight and size-wise, the WO 66 Zenithstar APO is just about a perfect match for a C8. Have I made you anxious to learn more about this wee scope? If I have…hope your Old Uncle gets some clear star partying weather over the next month or two, weather that will allow him to really put the 66 through her paces (and maybe even use her for an astrophoto or two). Celestron's SkyScout: Uhhh! What is it Good for? 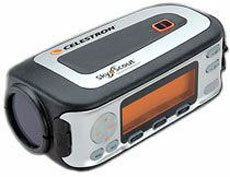 That was my initial impression when I heard about the Celestron SkyScout “star finder” a year or so ago. Oh, the concept sounded interesting, I'll grant: take an enclosure about the size of a small camcorder and equip it with a GPS receiver, a digital compass, and a level sensor. The user points it at “something” in the sky, a star, a planet, whatever, and the little gadget identifies said object, both on an LCD display window and via audio. The audio spiel doesn’t just say “Sirius,” either, it includes a nice commentary on the star (and many other objects). Add a “Locate” mode that guides users to chosen objects, nightly tours, constellation stick figure displays, and the ability to upgrade the firmware with a USB connection and add new features via an SD card slot, and, yeah, you’ve got a right interesting little device. Then I saw the price, $399.00, which gave me pause, you'd better believe it, Bubba. No, 399 ain’t that much in these affluent times (to you, maybe, anyway), but as I began ruminating about the utility of the device, this price seemed to attain larger and larger significance. Given the capabilities of the SkyScout, I imagine a prime target audience of “12 and under” along with some older teens. This audience probably would enjoy the SkyScout (for a while, anyway), but I would guess their parents, even those somewhat free with money when it comes to iPods and Xbox 360s, might balk at opening their purses and wallets one more time given the limited utility of the SkyScout. While I wouldn't say an Xbox has much educational value, it does have enduring fascination for the young set. It damned sure gets used (admission: I like it too). So, the bottom line? The "catch" when it comes to the SkyScout is that it is not a telescope (think TELRAD, no light gathering power). Given this overriding fact, it seems to me that the SkyScout will be of very limited interest to amateur astronomers, or even to the lollipop set: "Well, this here pinpoint is Sirus, this one is Rigel, this one is Saturn, and I think I am now going inside and play Halo III.” Sure, I admit the average teen or amateur astronomer could have a lot of fun with this for a few nights, but, no, I’m not convinced of its enduring appeal and hence value at this price. At $199.00 this would be an incredible buy for anybody; just for the built-in GPS receiver. However, your old Uncle Rod must admit he has not yet seen a SkyScout in person, much less used one. Maybe I’m missing something. One thing I do know? Folks are snapping up SkyScouts like beer and peanuts at the ballpark. 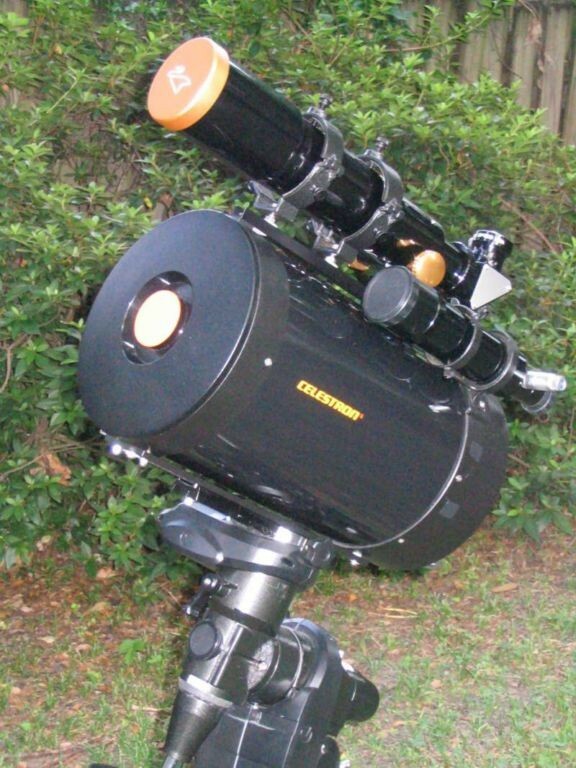 Celestron's little gadget, I’m told, is backordered and is being sold on eBay for $599.00 e’en as I speak. Is it the next Cabbage Patch Kids? Will parents be fighting over these things as Christmas approaches? Me? I’m willing to be convinced. I suppose I could find some use for one of these (maybe helping me and the public get oriented at my star-poor urban star parties), but I am still shakin' my head. Maybe it’s just that, to this child of the 1960s, 400 George Washingtons is a lot of money! Uncle Rod, What Am I Supposed to Bring to a Star Party? Glad you asked. The 2006 Fall Star Party Season will be here before we know it, and a lot of new star partiers are no doubt concerned/confused about exactly what and how much stuff they should pack. And I'm sure y'all are also tired of hearing me pick, pick, pick at Meade. When I'm going to be at a star party over several days as opposed to a single evening at a club dark site, I bring the following in addition to the usual stuff (the "usual stuff" being scope, mount, eyepieces, dewshield, DewBuster, laptop, cameras, battery, red flashlight, star atlas, etc.). —Sufficient, suitable clothes and all the personal hygene items needed for the length of your stay. The latter should also include things that are rarely furnished at a star party like towels and soap. You might want to bring a roll or two of TP, too. —Desert storm type cover for the scope and line/tent stakes to stake down the tripod (I've seen all too many scopes crash to the ground after a sudden windgust, even East of the Mississip). —Dining canopy (an EZ Up to be precise). If these are allowed on the field, they are a godsend. Even in fairly northern climes the sun can be brutal, even in the fall. —Tent. I tend to eschew tents as I get older, but I will still sleep in one if there is no alternative; no accomodations onsite or nearby (my idea of "roughing it" is now the Holiday Inn Express in Chiefland, FL). If a tent it must be, err on the side of "too big" rather than "too small." You'll be much happier. I'd say "choose one that's easy to erect," but, luckily, most tents are pretty easy to set up these days. —Sleeping bags. Even if there are cabins and bunks onsite, I bring a sleeping bag. Much easier than messing with sheets and blankets. Make sure the bag you bring is suited for the temperature conditions you will face. And don't forget pillows for your poor noggin. —Ice chest and plenty of bottled water (and whatever other beverages you may require). Always have plenty of water available, and don't forget to drink some occasionally while observing. If you get dehydrated, you WILL get tired. For that reason and others, save the moonshine for dawn. —Plenty of ice (unless it's available onsite). —Binoculars. I rarely use 'em on a club dark site evening, but I always wind up using them at a star party. Usually a pair of nice Canon 12x35s for Dorothy and some humble Burgess 15x70s for me. —Emergency eyepieces. I squirrel away a few "OK" oculars in the scope case just in case I ever forget the eyepiece case (is that too many "cases"?). Forget to bring any eyepieces and you'll be at the mercy of a vendor who will be only too glad to sell you a 25mm Kellner for fifty bucks. —Snacks for latenight use. I favor jerky and chocolate these days. Take a break at mid evening, eat a little, drink a cup of coffee, and stretch your legs with a ramble around the field. Do this every hour or so and you'll be surprised how easy it is to keep goin' till dawn. —A tool set, to include small allen wrenches (and, certainly, a hammer). —A plastic tarp or two. These always come in handy, and I like to set the scope up on a tarp. If I drop wee little things in the night they do not become lost in the grass. Bring some landscaping nails to stake down your tarp at its corners (tent stakes will stick up above the ground and you will be tripping over them all night long. —Rope/line (remember what Sam Gamgee's ol' Gaffer said). —Coleman stove and coffee maker. Even if meals are available onsite or close at hand offsite, I bring a modern electrically lighted two-burner Coleman. If nothing else, one of the Coleman Mr. Coffee style makers that fits over the stove means you can make a thermos or two of fresh coffee at sundown (unless you can shield it, you might not want to fire up the Coleman after dark...the burners put out a surprising amount of light). —Camp/lawn chairs. I now favor the folding canvas chairs that go in bags. I do bring one lawn-style chaise lounge, as both my wife, Dorothy, and I like to use that with binocs. —Entertainment stuff (for use when it's cloudy or during the day). Books/magazines, etc. I also usually bring some DVDs that can be played on the laptop. —I usually bring a CD player/MP3 player to listen to while observing. Sometimes I use it; sometimes I don't. I don't usually listen to music early in the evening—I prefer to talk to my fellow observers, or just listen to the ambient field sounds. Late in the evening as the observing field thins out, however, listening to CDs seems to help me keep going. —Batteries. Even if there is supposedly power on the field, I always bring plenty of 12v batteries (I now favor deep cycle marine/trolling motor batteries). Just in case, you want to be able to run your PC/scope all night on battery. Also, replacment batteries for flashlights, radios, etc. —If you don't have a 12vdc cord for the laptop, pack a good inverter (I have one of the Black and Deckers they sell at WallyWorld, and it works well). Forget getting much time out of the laptop's onboard battery, especially if you're using a USB camera that needs power from the laptop! —A good battery charger. I favor one of the heavy-duty computerized quick-charge jobs. They are surprisingly affordable. —At least one white-light flashlight (or a red LED light that can be switched over to blue LEDs at the touch of a button). This will come in handy when you are off the field and walking back to the cabin. —A long extension cord and a multi receptacle power strip or similar. —If it's the end of the season, and I know I'll be staying in a drafty cabin, I bring a small, safe space heater. —If we're moving into November and I think it's gonna be chilly, I bring some chemical handwarmer thingies in addition to coats, gloves, etc. —If it is likely to be cold, dress in layers. Pay particular attention to your head and feet. Spreading a carpet square on the ground next to your scope will keep your footsies insulated from the cold, cold ground and will help a lot. —Observing table. I usually use one of those folding camp tables, but a card table can also work. —Some kind of shield/enclosure for the laptop (to keep dew off and further shield the screen (suitably red filtered) from other observers' eyes). Do I bring this much stuff all the time? No. If I'm flying in to speak at a star party, I just bring myself and maybe a pair of binocs. For a day or twoer, maybe half this much stuff. For a multi day affair (e.g. the TSP), yes, all of it. I will say that in recent times I've tended to reduce/minimize. A C8 on a GEM instead of a larger/fork mount scope. Small, disposable styrofoam ice chest, no stove and coffee maker if there's decent coffee on site or a Micky D's in range, etc., etc. You should have seen what some buddies of mine and I took to the 1997 TSP (we rented the largest Ryder truck available), only to be mostly rained out. But back then I was young(er) and foolish. How Much Would You Pay for a Meade Catalog? Well, how much? What's one of the Irvine, California Telescope Company's glossy uber-full-color-100-plus-page extravangazas worth to you? How about five bucks? Yep, Meade, whose new print catalog has been "in production" for at least a couple of years, proposes to sell you the new one for an Abraham Lincoln. There's little doubt it's gonna be a nice catalog, sure. It's been the slickest pub of its kind amateur astronomy has ever seen (compare the earlier editions to the pitiful brochures Celestron used to hand out), and I know many folks have gotten a lot of enjoyment out of it over the years. I've gotten a lot of enjoyment out of it over the years. No, I've never really used it to make buying decisions, but it's provided a tremendous amount of reading pleasure as I've browsed through it while sitting on the...on the—well, you get the picture. Since a new Meade Wishbook was long overdue, I was excited to see it announced on the company's webpage the other evening. 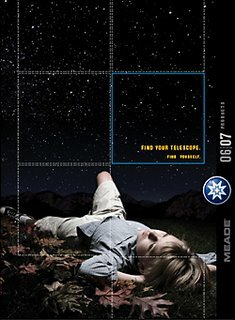 Yeah, I was surprised, when I read more closely, to find that: 1) Meade is taking "pre orders" for the catalog; it's not actually available yet, and 2), they want you to send 'em your credit card number for the privilege of looking over their newest toys (and, to be honest, the pretty astrophotography of many of your Meade-using brothers and sisters, something, maybe, that's enough to make you decide five smakers ain't so much). Actually, I wasn't exactly dumbfounded by this. The last time I talked to a Meade rep, he'd mentioned that the new regime at the company was troubled by the expense of creating the next edition of the legendary Meade Monster Mash. All in all, I just wasn't offput by their abject begging for a fin—I've often wondered how they can afford to produce these things. But would I really give 'em a fiver for this? Prob'ly; all things are relative. Hell, y'all oughta see my bar tab from last weekend. No, it's not the fin that troubles me; it's he image this scheme seems to present. Meade insiders have said the company's top management is aware of and concerned about the unfriendly image they have developed with some amateurs. OK. Good. But then this sell-the-catalog idea comes along and seems to say, "Send us your astrophotos, guys, and we'll be happy to put 'em in our advertisements and sell 'em back to you. Suckas!" Not very helpful to Meade given the current state of the telescope market, even if gleefully shaking us down is really not the intention. Me? Yeah, I'm gonna send 'em my five bucks...it gets awful boring in the "reading room" without a new Meade Book, lemme tell ya. Coronado Gone? Solar Observers Tell Uncle Rod: "We Told You So"
If you have any interest in observing ol' Sol, especially or mainly at hydrogen alpha wavelengths, you've heard of Coronado Instruments. Their Ha filters began making a big impact on amateur Solar observing several years ago. In fact, many amateurs and small colleges couldn't even dream of setting up a scope for hydrogen alpha work Before Coronado. "B.C.," Ha filters were expensive, difficult to use, and usually didn't deliver the kind of results amateurs dreamed of (images like those we saw from scanner-equipped pro scopes). But then along came a little amateur astronomer-run company from Tuscon, Arizona, Coronado Instruments, a tiny outfit that began to sell some truly amazing gear. Imagine: Ha filters that didn't need to be plugged into a mains supply and fiddled with endlessly. Imagine razor sharp and detailed images of prominence and disk detail. Imagine being able to view in hydrogen alpha and not having to sell your firstborn to pay for it. Coronado's initial output was amazing enough, but they did not stop there, oh, no. The Coronado filters and some dedicated Solar scopes, including 60 and 70mm refractors, impressed even the most jaded Sun-watchers, sure, but it was not until they introduced their "PST," Personal Solar Telescope, that Coronado really set daytime amateur astronomy on its ear. The PST was in every sense a breakthrough. It was/is a 40mm refractor with a built in hydrogen alpha filter and performance similar to that of Coronado's earlier and larger scopes. The PST was advertised as being able to deliver stunning views of both prominences and disk detail, just like its big sisters. There was one huge difference between the PST and Coronado's other Solar telescopes, however: price. Yeah, the approximately $3500.00 tab for the Coronado 60mm was OK compared to what we were used to paying to observe Mr. Sun in the deep red end of the spectrum. OK. But the $500.00 that Coronado began quoting as the price for a PST for literally astounded us. How could they possibly do it? Amateur astronomer skepticism quickly turned to enthusiasm, however, when we got our first looks at the Sun through the little 40mm aperture thing. While disk detail may not have been as good as what a Coronado 60 or 70 could show, it was still very good indeed. And the PST's views of prominences, what many new observers are most interested in, were, frankly, just as good as what the more expensive models could do. Certainly much better than what many of the horrendously expensive hydrogen alpha filters we used to slap on our Orange Tube C8s produced back in the bad old days. Not to paint too much of a Jack Armstrong All American Boy picture. If I recall correctly, Coronado started life on the Isle of Man, and decamped for the greener pastures of Arizona once success began to come, leaving their original employees in the lurch. ANYWAY, Things shortly began to look incredibly good for Coronado Instruments, with us members of the astronomy chattering classes predicting incredible success for them--at least in a small amateur astronomy sort of a way. Then, wouldn't you know it, dark clouds began to gather. First and shockingly, Coronado was sold to Meade Instruments. I've always liked Meade equipment, but there's no use denying that many amateurs look on the California SCT maker as the Deathstar of the equipment biz. We were all just real surprised that Coronado would throw in the towel when it looked like the only way for them to go was up. This move became a little less surprising when we learned that Coronado's founder, David Lunt, was seriously ill. Following David's death in January 2005, Coronado fans began to wonder what would happen. Would Meade close the company's little plant? Move production to China? Me? I told everybody who'd listen that I doubted that would happen. Coronado had become very well respected among amateur astronomers, and respect is something that's hard to beg, borrow, or buy. Especially, it seems, for Meade these days. Wasn't the respect and admiration the Coronado name had engendered in its short life worth a lot to the Irvine bunch? When it became clear (or seemed to) that Coronado would stay in Tucson where it could continue to take advantage of its (second set of) dedicated employees and also the resources of the Tucson optical community, everybody relaxed a little. Meade said they wouldn't move the company, and that sounded believable now. Like Uncle Rod said, "Why kill the goose that laid the golden Solar egg?" Surely Meade understood that. They seemed to. At least, Coronado stayed where it was and the quality of the filters was as good as ever. "The Company also reported the planned closure and consolidation of its Coronado(R) Instruments manufacturing and distribution facility in Tucson, Arizona, which will result in an additional estimated decrease of $800,000 in annualized operating costs. This consolidation will eliminate 16 employees by August 31, 2006. All Coronado operations are being consolidated into the Company's Irvine facility, with no associated increase in SG&A expense expected for that facility. " What more can I say at this point? I just feel a little sad. I do hope Meade will continue to produce excellent filters under the Coronado name, filters David Lunt would be proud of. Do I believe Meade will? I'd like to say "yes," but after being proven wrong once in a big way, I'm gonna wipe the egg off my face and wait and see what goes on in Irvine (or Taiwan).